Thought I’d finally try one of the Aurelio Zen books narrated by Michael Kitchen. After finishing Blood Rain, I think I’ll be skipping the rest in the series. The story wasn’t my cup of tea, and for the first time, I understood the occasional negative reviews that MK receives for his narration style. He read the first chapter in such an odd, halting manner that I was tempted to give up on the book after half an hour. 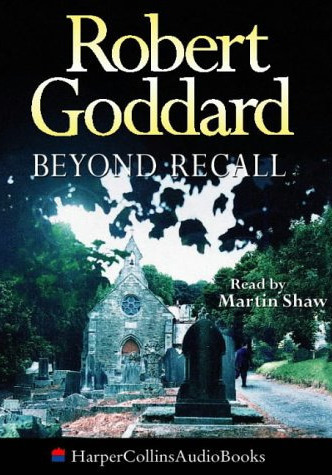 The distracting pauses between words did eventually subside, but I wasn’t swept away by this audiobook as I have been by the others MK has read. Mafia crime is perhaps too much outside of my realm of interest. Far more enjoyable is the Georgette Heyer audiobook I’m now listening to narrated by Richard Armitage, another Leicestershire-born actor with a gorgeous voice and expert narrative abilities. Finished listening to The Great Train Robbery today. One of my favorite movies is now one of my favorite audiobooks as well. 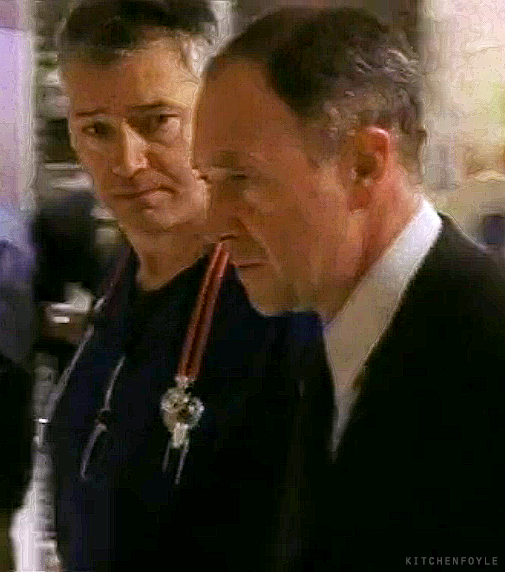 Michael Kitchen’s expert narration gave distinct voice to each of the characters in the large cast, vividly bringing the personalities to life. Loved all of the additional historical background provided in the book. And the exposition on the physics pertaining to a moving train made Pierce’s feat of traversing the train cars all the more thrilling and amazing. Swimming without a roof over your head has become a subversive activity, says Roger Deakin – and it’s one he pursues with glee as he breast-strokes, crawls and occasionally paddles his way around some of the UK’s more esoteric swimming places, from lazy ox-bow rivers to icy glacial lakes, from the balmy Scilly Islands to the Norfolk Broads. This is eccentricity elevated to an art form, a meditative hymn to the atavistic pleasures of water, which is expertly accentuated by Michael Kitchen’s abrasively English reading. It’s one to listen to again and again. Just finished reading Robert Harris’s novel, An Officer and a Spy, about the astounding Dreyfus affair and can’t help thinking that I’m living through a similar abuse of power at the highest levels of government. We need the equivalent of a Colonel Picquart to expose the corruption and lies. 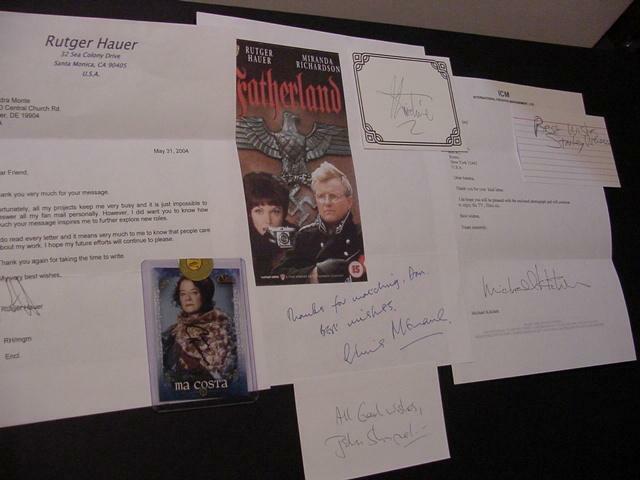 Two other bestsellers authored by Harris, Fatherland and Archangel, are familiar to fans of Michael Kitchen. If only the Trump presidency were like the Nazi regime in Fatherland — alternate history fiction. 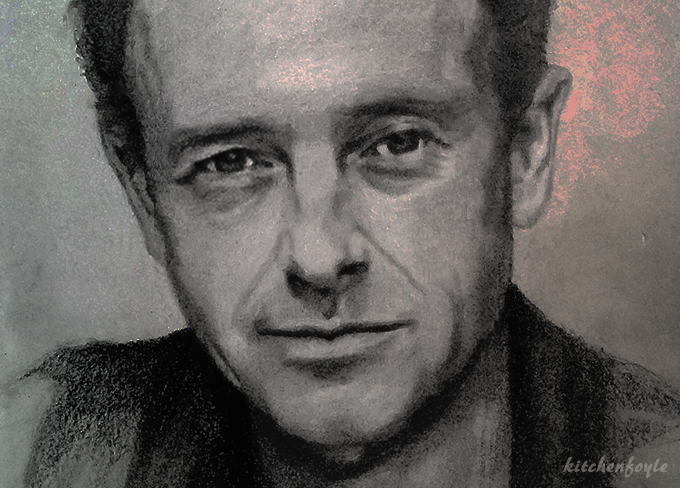 An excellent reader like Michael Kitchen (Foyle’s War) is an added bonus. His clipped, ironic delivery perfectly matches the author’s sardonic wit. The complex language makes the novel perhaps easier to listen to than to read and Kitchen’s performance gives us many laugh out loud moments. Provocative and unsettling, Jacobson’s insightful examination of contemporary Jewish identity gets resonating attention from British actor Michael Kitchen. I really enjoy anything read by Michael Jayston and Michael Kitchen. Both are marvelous. I’ve just listened to Jayston reading P. D. James’ “A Certain Justice” and it was marvelous. When he read the part of Winston Churchill in “They Speak for Themselves” you forgot it wasn’t Churchill himself reading. I recently heard Michael Kitchen reading Graham Greene’s “The End of the Affair” and it was very well done indeed. In an audio book, the narrator is as important as the author. If the voice is too low or too high pitched, it ruins the story for the listener. For those who haven’t heard Jayston or Kitchen, I suggest giving them a try. 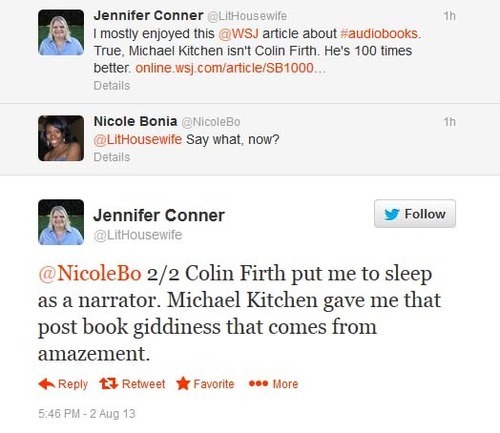 AudioFile’s page on Michael Kitchen is just what I was looking for — a list of MK’s major audiobooks accompanied by short reviews. Almost uniform high praise for MK’s narration save for a few duds. And having recently listened to Two on a Tower, I couldn’t agree more with the plaudits Michael Kitchen receives at audible.com for his enthralling reading of Thomas Hardy’s novel. Back in 1975, Michael Kitchen played Swithin St. Cleeve in “Viviette”, a radio play of Two on a Tower. Wish I could give that a listen. One of the “Other Tales of Terror” on the Jekyll/Hyde album is “The Body Snatcher”, and it’s available to listen to for free at esl-bits.net, a neat site even for those whose first language is English. I loved Wuthering Heights when I read it and when I saw the film (the old one with Laurence Olivier) but I was never a fan of Heathcliff. I loved the language, the beauty of it and the flow of it all of which fit perfectly with Michael Kitchen’s glorious voice. When I first heard MK’s voice, I thought perhaps I should not listen while driving. Fortunately, I did not run into a tree. Happened upon Catherine’s description of her love for Edgar and was reminded of your comment, SC. The quote pretty much sums up why this site exists, too. A dreamy photo landed in my inbox last week, and out came the drawing materials and MK audiobook (one in which he does an American accent – sort of. 🙂 ) Thanks so much, KT! 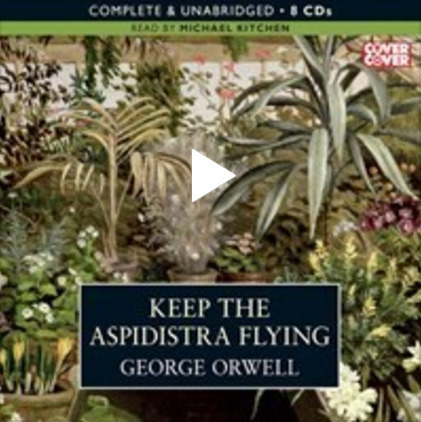 The various voices Michael Kitchen uses in his superb narration of Keep the Aspidistra Flying (1998) kept me smiling throughout this surprisingly funny and romantic novel by George Orwell, an author I’d previously only known from my required high school reading of 1984 and Animal Farm. When I learned that there’s a movie adaptation starring Richard E. Grant, my first reaction was how much more suitable a 30-year old MK would have been for the role of the diminutive Gordon Comstock. MK playing opposite Helena Bonham Carter as Rosemary would be dream casting, imo. I don’t think I have heard Michael Kitchen before, but in the hundreds of audible books I have listened to, I think he is the best narrator thus far. He is so good that you never notice the narration – you feel you are listening to the different characters as they speak. Fantastic. What a good subject he makes. 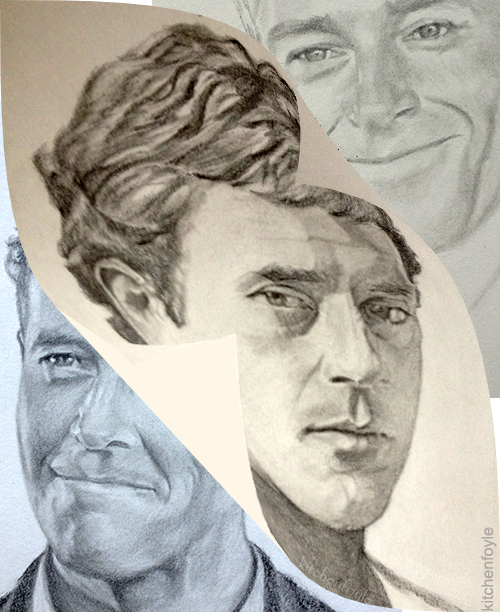 Drawing, as it turns out, is the one activity I’ve found that allows me to properly concentrate on an audiobook for an extended period. I might actually make it through one at last. Naturally, I’m listening to one read by MK. I’ve never heard Michael Kitchen say his own name, so his intro to the Making of Foyle’s War DVD bonus feature is quite a thrill. 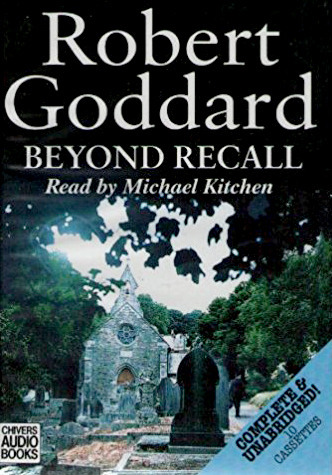 At the beginning of every audio book he says, “Read by Michael Kitchen”. I never get tired of hearing it. Nice to actually see him say his name. I must have missed it in the one audiobook of his I’ve tried. The book was Wuthering Heights, a novel whose appeal I never understood, but I thought MK reading it might change my mind. Nope…it was all I could do to stay awake through one chapter every time I tried to listen – finally gave up. I have all of them and WH is the only one I couldn’t get through. Hope you give the others a chance as he is wonderful to listen to.